This month is the time where we get swept up in Valentine’s Day in a flurry of cards, balloons and chocolate hearts. It’s a holiday where we go out of our way to impress and express our love, full of romantic dinners, extravagant dates, or just heart to heart conversation with those we love. Amidst it all, people hunt for the perfect present to give their partners to show them how much they are loved. You might be surprised that one of the most generous things you can do for your relationship is to be proactive about your hearing health. When you struggle with hearing loss it’s important to recognize that your hearing issues affect everyone around you, and especially those closest to you. Hearing loss can obstruct healthy communication and create impediments to emotional connectivity. Untreated hearing loss can weigh down a relationship and be difficult to accommodate. When you treat hearing loss, you do yourself – and your loved ones – a favor. When you have trouble hearing, it can rapidly make an impact on your closest social relations – your friends, your family and your partner will most likely notice a change in your communication, perhaps even before you do. In part that’s because they are hearing things you may be missing and notice when you miss social and sound cues in a conversation. In fact, untreated hearing loss does cut you out of smooth conversation. Hearing loss can limit what you comprehend and make communication frustrating for both you and your loved one. Both of you may feel misunderstood and disconnected. Untreated hearing loss has been linked to a higher incidence of social isolation and experts believe that the breakdown in comprehension that it engenders is responsible. When you can’t hear your partner, you miss out on their thoughts and feelings, even the everyday goings-on in their life. Reckoning with your hearing loss, your partner may gradually withdraw from verbal communication with you because of the difficulty of conveying their meaning. If communication breaks down between partners, an isolating gap begin to grow in the relationship that pushes people farther apart. Your romantic partner is probably your biggest fan, and when you go through something difficult, like hearing loss, they can be a huge source of help and support. 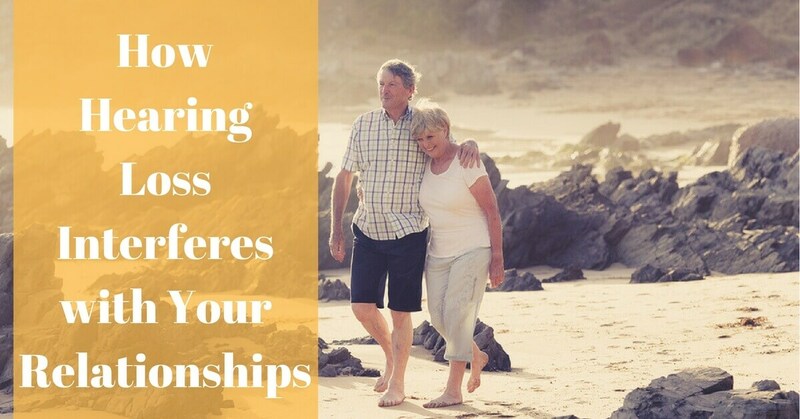 In a survey of people with hearing loss most people cited their relationships as those most in tune with raising awareness around hearing loss and accommodating for hearing disability. When left untreated, however, hearing problems can tax this dynamic. People surveyed also reported that their significant others were the most negatively impacted by their hearing loss. When hearing loss goes untreated, it often means that partners witness their loved one struggling. Whoever said “distance makes the heart grow fonder” wasn’t talking about emotional distance. Very often hearing loss in a relationship leads to less shared experiences and more loneliness. Companion activities, like going to restaurants and sporting events, or even just watching television together may drop off because hearing loss makes them less enjoyable. Conversing and confiding in one another also becomes an uphill battle. For an individual with untreated hearing loss, they become more vulnerable to mental health struggles such as anxiety and depression. Often for a partner, this means that supporting a significant other through hearing loss is more complicated and emotionally intense than they anticipated. Luckily, even if you have hearing loss, there are still solutions that can help you improve and manage your hearing. Accessing solutions like hearing aids and streaming sound devices can go a long way in reversing the ill effects of hearing loss and the damage it can wreck on your relationships. If you think hearing loss may be holding you back, your first step is to get your hearing tested. There’s no better time than now to have your hearing examined, and there’s no better place to do that than Elite Hearing. With our thorough testing and personalized care, we offer you a nuanced diagnosis of your hearing health. With our full selection of top-brand hearing aids and accessories, we can find the most compatible solutions for any hearing issue. This season, give yourself and your loved one the gift of healthy hearing and fall in love with each other all over again.